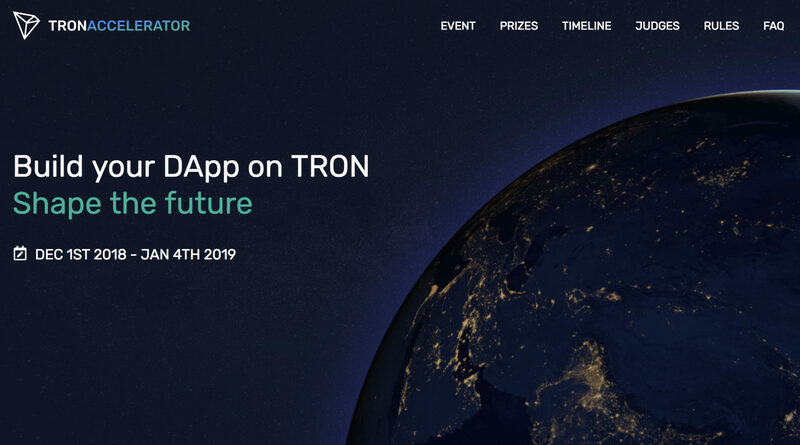 Tron, a dapp platform that is now ranked the ninth most valuable by market cap, bought pioneering peer-to-peer filesharing application BitTorrent in July last year. The project is led by Justin Sun and has recently been gaining traction both in terms of adoption and price. But all may not be what it seems at first glance say its doubters. It stands accused of pumping the price of its token – TRX – by luring devs onto its platform, especially from Ethereum, under false pretences with its generous competition prizes in its accelerator programme. Reddit user 9hil is one such critic. More available on the reddit here. I reached out to Justin Sun on Twitter (and discord) for a comment. Within 10 minutes he popped up on the discord channel, promising to release a statement in an hour. This story is unfolding as I write but to be fair to Justin Sun he is responding to developer complaints. For example the anthill dapp which is a clone of Shrimp Farm (described by 9hil as a ponzi game), which in turn is a clone of the original Ethereum game, is no longer in line for a prize. Devs were perplexed as to why high-quality dapps were not getting a look in. One dev who has built a remittance dapp called instancheque – as opposed to yet another game – got nothing. Even an app that had previously been praised by Sun –TronGoo – and which currently has the largest transaction volumes, apparently only received the bottom prize. Sun says he is looking in to why TronGoo has been overlooked. 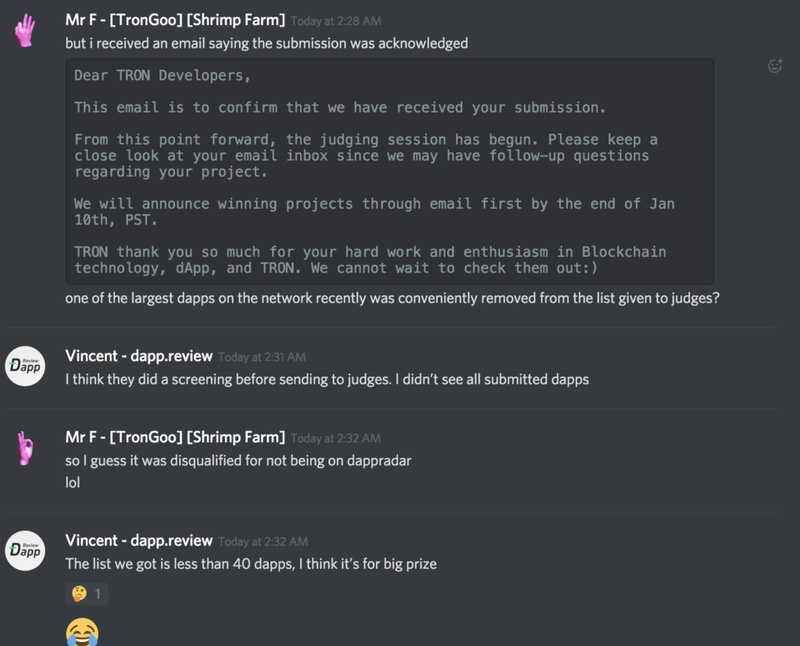 A number of dapp developers also say that their submissions had not even been looked at by the Tron team, claiming they were screened out before being seen by judges. 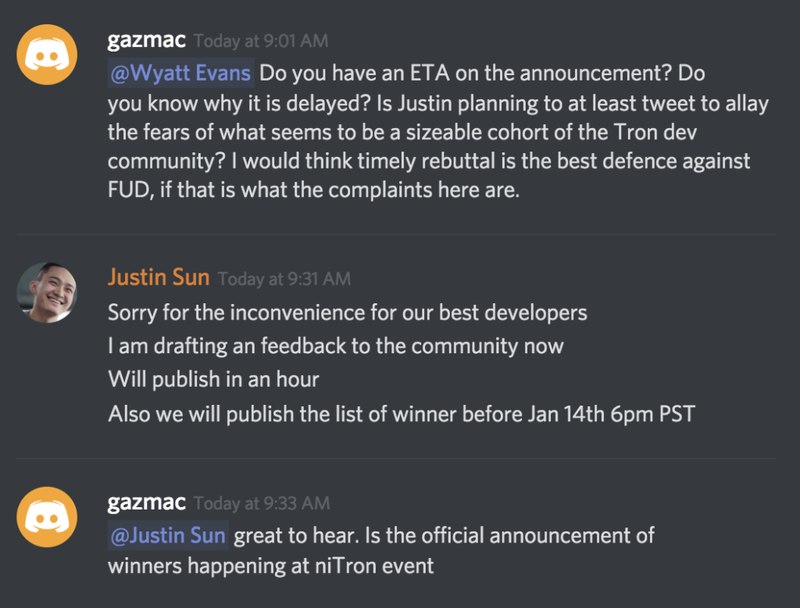 Other devs say their dapps were disqualified with no reason given, such as dapp called TronJoy. 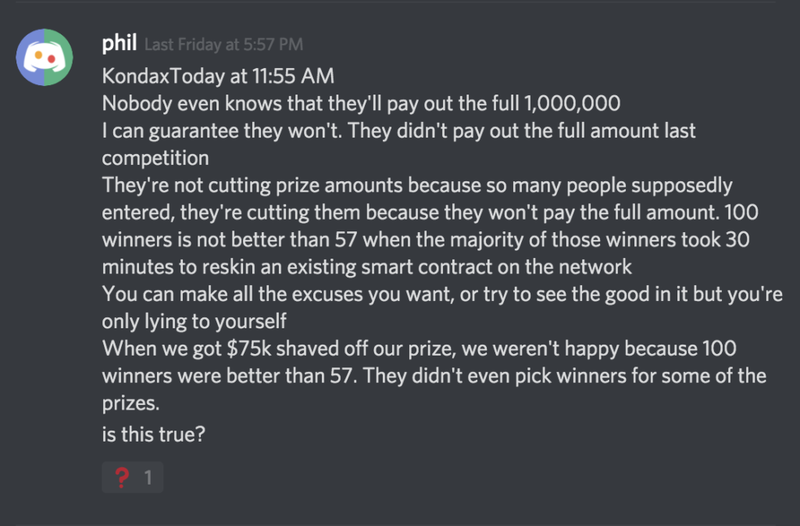 By way of an explanation for the meltdown of the accelerator competition, Sun said that the company only has one person working on it and was fixing that. He also admitted he should have visited the discord channel instead of confining himself to his favoured social media channel, Twitter. Sun is fairly busy on twitter, where he is found of poking fun at Ethereum and co-founder Vitalik Buterin in particular. On 9 November last year Tron beat Ethereum’s daily transaction record set in January 2018 (1,367,488 v 1,349,890). A large part of the transaction total was accounted for by betting dapp TronDice. It is believed the public announcement of winners will take place at the niTROn event taking place next week in San Francisco on 17-18 January. Simon Morris, previously chief strategy officer at BitTorrent, is disparaging of Tron’s tech, which is derided by its critics as essentially nothing more than a copy of the Ethereum virtual machine, with dPoS bolted on top. 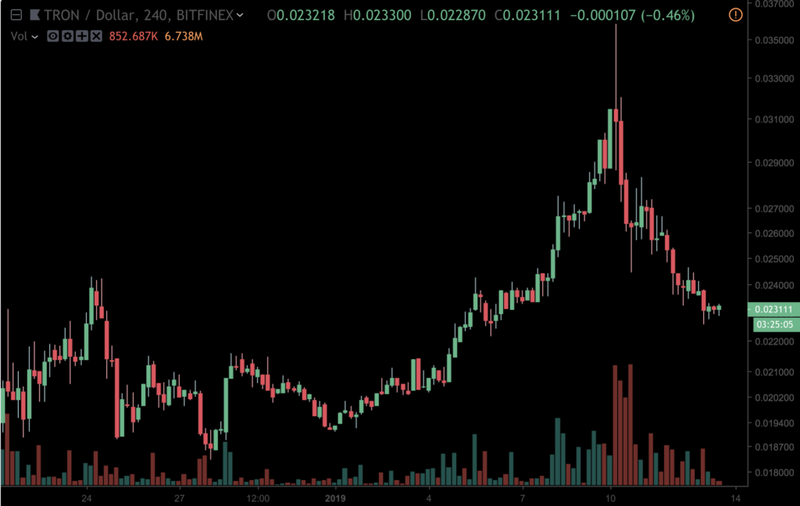 Crypto market watchers will have noticed that Tron has been outperforming of late. 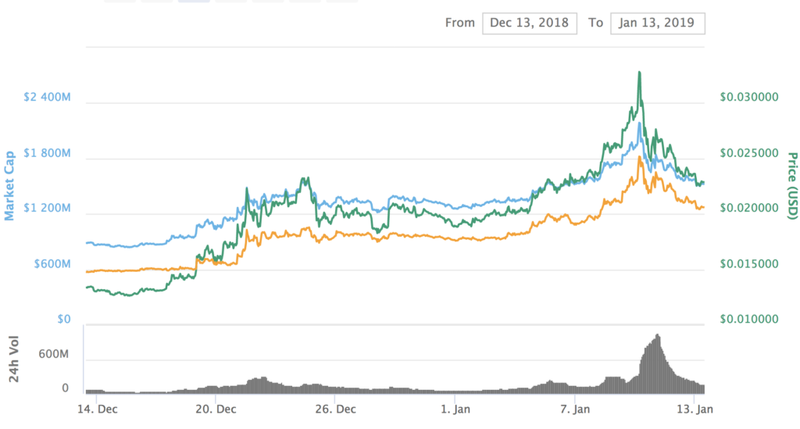 Between 13 December and 10 January, the TRX price increased from $0.0133 to $0.0327, for a gain of 145%, but has fallen steadily since then to $0.0228, according to coinmarketcap. Judging by Justin Sun’s comments on the discord channel, many of the criticisms are being addressed or at the very least there is some sort of damage limitation operation in progress. However, the statement promised to devs on the discord channel is yet to appear, but we will update this story when it does. This episode highlights the seemingly amateurish nature of the conduct of leadership teams and the lack of consideration for matters of transparency by many leading projects in the space. Jimmy Song from Blockchain Capital is not much enamoured by Tron. He predicts the price will drop to 0.001 by 1 February and 0.0005 by 31 December. However, all those critics who happen to back other projects, be it Ethereum or EOS, may just be having a bout of sour grapes. The tx numbers presumably don’t lie, but if they are artificially inflated by throwing money at devs only for that support to be subsequently withdraw that support, adoption could presumably plummet. Tron’s mainnet was launched in June last year. It got into trouble for plagiarism last year when it was discovered that its whitepaper include source code copied from Filecoin and the InterPlanetary File System (IPFS) in its whitepaper. Also Sun teased the cryptosphere with hints of a partnership with Chinese internet giant Alibaba which proved not to be the case.